After six years studying sculpture in Paris and London, Mackennal returned to Australia in 1888 to execute two commissions. He became the centre of controversy in Melbourne over the worthiness of his entry in a competition for a major bronze figure group to be placed outside the National Gallery of Victoria. Debate raged in the press and came to the attention of Sarah Bernhardt, then established as the world's greatest living actress. She recommended that Mackennal return to Paris as "he is buried alive here". Mackennal was to become good friends with Bernhardt, who toured Australia in 1891, and taking her advice he returned to Paris, where he completed her relief portrait in bronze. Art Gallery of New South Wales picturebook , Sydney, 1972, 88 (colour illus.). Famous people: a selective who's who from works in the Art Gallery of New South Wales , Sydney, 1981, 2 (illus.). 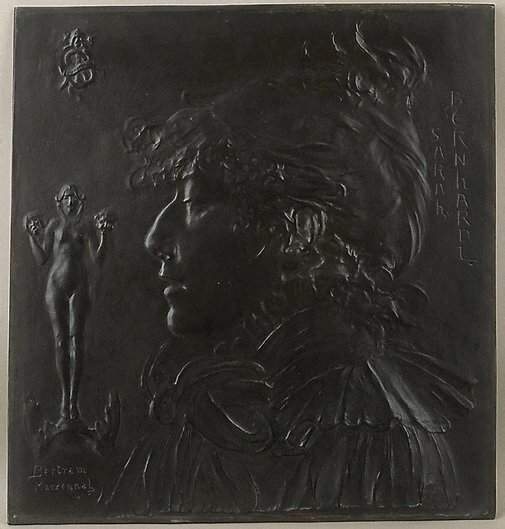 Meri Machin-Roberts, Bertram Mackennal: the fifth Balnaves Foundation Sculpture Project , 'Portraits of contrived publicity: Betram Mackennal's commissions from Sarah Bernhardt', pg. 164-167, Sydney, 2007, 52, 54, 110, 164 (colour illus., detail), 165 (colour illus.). Denise Mimmocchi, Australian Symbolism: the art of dreams , ‘Sarah Bernhardt: the ‘serpent of the old Nile’’, pg. 35-40, Sydney, 2012, 38, 39 (colour illus.). Barry Pearce, Art Gallery of New South Wales handbook , 'Australian', pg. 13-35, Sydney, 1988, 23 (illus.). Ursula Prunster, Australian art: in the Art Gallery of New South Wales , 'Home and abroad', pg. 73-74, Sydney, 2000, 90 (colour illus. ), 301. Australian sculptors , Melbourne, 1980, 404 (illus.). Daniel Thomas, Art and Australia , 'Australian collection', pg. 52-62, Sydney, Jul 1972, 60 (illus.). Unknown, Come to Dazzle - Sarah Bernhardt's Australian Tour , Strawberry Hills, 1998, 138, 340 (illus.). Australian icons: twenty artists from the collection , Sydney, 2000. Unknown, Biographical dictionary of medallists: coin, gem, and seal-engravers, mint-masters, &c., ancient and modern, with references to their works B.C. 500-A.D , London, 1907, 524. 1890s: aspects of the gallery , 'The influence of Sarah Bernhardt's Australian Tour', Sydney, 1986, (illus. ).